Energy economics through the game. 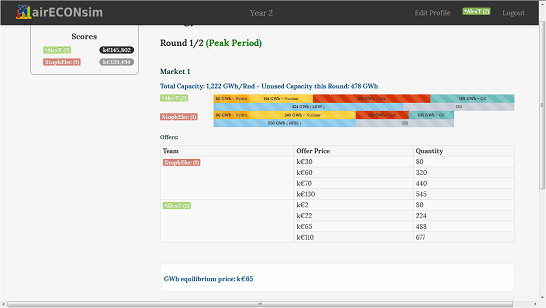 The Energy Game is a market simulation game for trainings in energy economics and industrial organization. Players are responsible for managing the fleet of electric power producers competing over the same markets. They must sell their energy on a wholesale market over several -peak or off-peak- periods, and organize their production to meet demand. The game environment is changing every year: Players have to constantly adapt their strategy and anticipate changes in the behavior of their competitors (crises, distribution network constraints, introduction of technologies' technical characteristics, mergers, emergence of environmental constraints, new technologies, cost evolutions, R&D...). Note To play this tutorial, you will need to check its companion document. Understanding electricity economics through the game. Reasons for diversifying the energy mix. Peak-load pricing and infrastructure dimensioning. Elasticity-price of demand for electricity. Physical characteristics of the different technologies. Environmental policies and CO2 emissions. We regularly offer (distance or traditional) trainings on energy economics or industrial organization, for all levels. The usual duration of training on energy economics is two days for a standard scenario, in French or English. The impact of distribution network's constraints on competition.